The project director on the Borders Railway has said an eight-week closure of an "extremely popular" walking and cycling route is "unavoidable". The Black Path between Langlee and Tweedbank will be shut from 17 February. 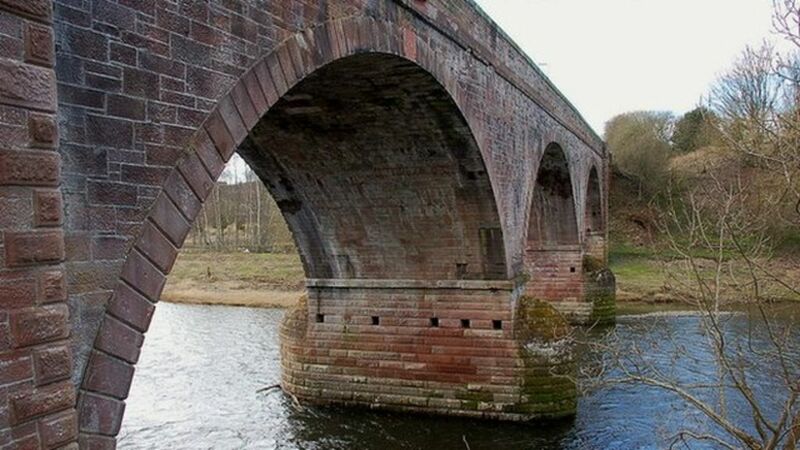 It is to allow a series of improvement works on the Redbridge viaduct over the River Tweed. The project director on the Borders Railway says an eight-week closure of an "extremely popular" walking and cycling route is "unavoidable". Looking south along the Black Path towards the Red Bridge at Galashiels on 24 October 2013. Beyond stands Tweedbank with the Eildon Hills on the horizon. Photographed from the temporary path recently put in place to bypass the bridge works on Winston Road [see image 42351] part of which is currently closed and inaccessible. Guardian photographer Murdo Macleod captures the paper's Scotland correspondent, Severin Carrell, interviewing CBR activist and Railscot contributor Bill Jamieson on the Red Bridge near Tweedbank on 1st November. Part of field research for a news article published on 6th November, the day of the Borders Railway signing ceremony at Newtongrange.